A Whiff of Spice: Is it a Khichidi or a Biriyani? I call it Hotch Potch; What will you?? Is it a Khichidi or a Biriyani? I call it Hotch Potch; What will you?? Come the monsoons and every Bengali household will have at least one Kichuri or Khichidi meal. Nothing soothes a Bengali soul more than piping hot Khichuri along with Illish Maach Bhaja (Crispy fried Hilsa Fish) and some Tomato Chutney on a gloomy, rainy day. The Bengali Khichuri is a lot different from its blander North Indian cousin, the Khichidi. The North Indian Khichidi is a lot lighter and made using minimum oil and spices. Hence, it is usually given to patients in recovery, whose digestive system is not in the best order, Nonetheless, it is very wholesome and nutritious. The Bengali Khichuri, on the other hand, is a lot richer, tastier and more flavorful and most definitely not very easy on the digestive system. Khichuri is a one pot nourishing meal made with fragrant Gobindobhog or Basmati Rice and dal (lentil), with or without vegetables. The consistency is soft and soggy but not runny, very much like the Italian Risotto. Lightly Roasted Moong Dal (dried yellow split peas) is usually the preferred choice of dal for a traditional Bengali Khichuri. However, Mushur/ Masoor Dal (Red Lentils) and Toor/ Arhar Dal (split pigeon pea) are also equally delicious choices for Khichuri. 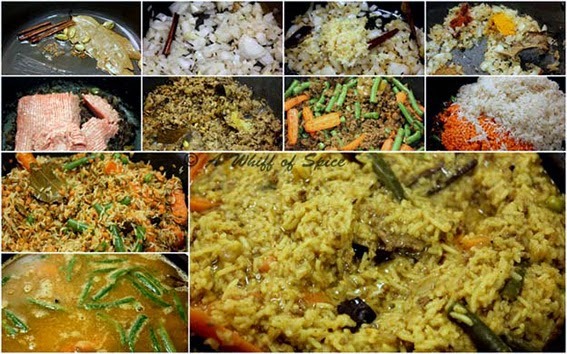 Moong Dal Khichuri is generally prepared the Satwik way, i.e. sans garlic and onion, but Mushur Dal or Arhar Dal Khichuri has onions and garlic in them. Personally, being the eternal carnivore, I am not too fond of the Satwik style Khichuri, except the Bhog er Khichuri, which I'll definitely share in one of my future posts. My favorite is the one made with Mushur/Masoor Dal (red lentil), onions and garlic. "Why is it smelling like Biriyani? What is it? Its looks like Khichuri but tastes somewhat like a Biriyani and it had meat too. "Hotch Potch", I replied slyly. Ever since, this had been a dinner staple on the days I am not very well or just plain lazy. Here is how I usually make this. 1. Wash and soak the rice and dal for 30 minutes. 2. Heat oil in a pan and temper with cumin seeds, cardamon, cinnamon, cloves and bay leaf. 3. Once the spices stops spluttering, add the chopped onions and saute till slightly golden. About a two minutes. 4. Add the grated ginger and minced garlic and fry till the raw flavor of the garlic is gone. 5. Add the salt, turmeric powder, red chili powder and Biriyani masala and fry till the masala are cooked through. approx 45 sec, splashing with little water, to prevent charring. 6. Now add the ground chicken and mix well. Cover and cook for 6-8 minutes, till the chicken is completely cooked through. 7. Next add the mixed vegetables and mix well and cook for another minute or two. 8. Now add the washed rice and dal and mix well with the masala. 9. Add the water and let it come to a boil on medium heat. Once it boils reduce the heat to med-low and cover and cook for 20-25 min, checking in between. You know its done when the rice is fully cooked, the dal is all mushy and majority of the water is gone. 10. Serve piping hot with a dollop of ghee (clarified butter). Ghee is always optional. But it does take the taste a few notches higher. Notes/Tip: The ingredients of this dish can be added, subtracted, swapped, substituted with anything that your heart desires. You can add any vegetables, any kind of meat or shrimps, or make it completely vegetarian. It will turn out delicious every time. Mushur Dal er Khichuri is a wholesome and nutritional meal. It has the perfect amount of carb-protein-fiber ratio for a diabetic. But I would like to tweak the rice:lentil ratio a bit to make it more diabetic friendly. Instead of the usual 1:1 ration, I would use a 1:2 ratio of rice:lentil. Enjoy this scrumptious meal with a some grilled or steamed veggies. I served mine with oven roasted zucchini and baked potatoes wedges. This is what I call a delicious and mouthwatering preparation.